What's New in Capital Forecast? New! The Locations - Bldg./Unit import is the easiest way to bulk-add or update location and bldg./unit information into Capital Forecast. Whether you’re entering your location information for the first time, or need to make updates; save time and take advantage of the Location - Bldg./Unit import! Updating or adding up to 700 new location or bldg./unit records with one import. Auto-assigning bldg./units to specific locations. Auto-generating location and bldg./unit codes for unique identification. New! You no longer have to wait overnight to see your imported data! Your data will now import into Capital Forecast instantly. Import your data as many times a day as you need. New! You can now associate warranties with multiple pieces of equipment and building components! Attach documentation to your warranties to easily access those important documents when viewing needs associated with the equipment or building components the warranty is tied to. New! You can now add file attachments and hyperlinks to your Building Components in Capital Forecast. 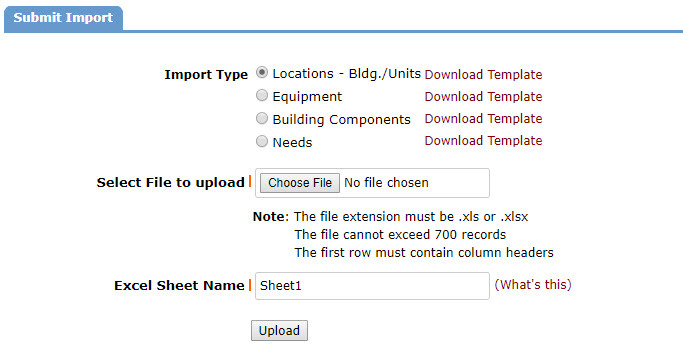 Track all your documents or related web information for your Building Components all in one place. For more information on how to use this feature, see our Adding Attachments to Building Components page. New! You can now add file attachments and hyperlinks to your Needs in Capital Forecast. Track all your documents or related web information for your Needs all in one place. For more information on how to use this feature, see our Adding Attachments to Needs page. New! Capital Forecast now includes support for 30+ site items including roadways, parking lots, fences, signage, and more items expected to be added in the future. Build a more comprehensive capital plan that includes your replacement needs within your facilities and on-site. Auto-estimate replacement dates and costs for site items. Add and filter capital needs by building system or site item. Import capital needs related to site items. If you have any questions about Site Items, or want to learn more, please contact our Support team. New! The Equipment Import is the easiest way to mass-add or update equipment and asset information into Capital Forecast. Whether you’re entering your equipment inventory for the first time, inventorying your existing equipment, or assessing their condition; save time and take advantage of the equipment import! Updating or adding up to 700 new equipment records with one import! Auto-generating unique (non-duplicating) equipment ID’s to identify equipment. Auto-activating locations, buildings, and areas that are disabled in your account, then properly assigning them to equipment. Adding new manufacturers, suppliers, condition codes, life expectancy units, warranties, and equipment categorizations, then automatically assigning them to equipment. For more information on how to use this feature, see our Importing Equipment page. Construction cost inflation plays a key factor in determining the appropriate amount of funding needed to renew or replace assets and complete future capital improvement projects. New! Capital Forecast now enables an administrator to enter a custom Annual Inflation Rate percentage between 0.00 - 10.00. The annual inflation rate is used to calculate the inflated estimated cost to renew or replace a building system, site item, or equipment. By default, the annual inflation rate is set to 0.03 (3%) under Account Setup | Account Information | Model Settings - see screenshot below. Capital Forecast provides an estimated cost to renew or replace a building system based on the cost per unit of measure, quantity, and regional index. New! Capital Forecast now calculates an Inflated Estimated Cost by applying an annual inflation formula onto the estimated costs. As an example, if the current (2017) cost to replace a building system is $100,000, and the system is due to be replaced in 2022; the cost to replace the system in 2022 will be $115,927.40, given a 3% annual inflation rate. Capital Forecast displays the Inflated Est. Cost and the annual inflation formula used to calculate the cost on the Update Need product page - see the screenshot below. The Inflated Est. Cost is also included on all Needs Reports. The Annual Inflation Rate was automatically set to 0.03 (3%) in your account. The rate can be manually adjusted in Capital Forecast under Account Setup | Account Information | Model Settings. The changes in this release will NOT impact your existing cost estimates. If you have any questions about the Annual Inflation Rate or Inflated Est. Cost, or want to learn more, please contact our Support team. Capital Forecast assigns a regional index to every major city in the US and Canada. This enables Capital Forecast to adjust cost estimates based on the average construction costs in your region. US Regional Index - New! We’ve updated the regional index for all US cities for 2017. We’ve also expanded the list to include over 250 US cities! Canadian Regional Index - New! We’ve expanded the regional index to include 70 cities in Canada! Custom Regional Index - New! Capital Forecast now supports a custom regional index. Using a custom regional index puts all the control in your hands. Want to increase your cost estimates by 10%? Using a custom index allows you to easily do just that. If you previously selected a Regional Index, we’ve made a minor change in your account in order to NOT impact your existing cost estimates. For example, if you previously set your Regional Index to Anchorage, Alaska (1.14). Your Regional Index (1.14) and also your cost estimates will remain the same. However, the Regional Index field will now display “Custom Index”, instead of “Anchorage, Alaska” (see the screenshot for details). This change was necessary in order to avoid adjusting your cost estimates, since the Regional Index for all US cities have been updated. For example, given the scenario where the Regional Index was set to Anchorage, Alaska, and fictitious values were established for Quantity and Cost/UOM, you can see how the new Regional Index (1.52) for Anchorage would have adjusted the replacement cost estimate. If you would like to apply the new Regional Index for the city you previously selected, simply reselect the city and save the model setting change. Afterwards, all your cost estimates will be adjusted based on the new Regional Index. If you have any questions about the Regional Index, or want to learn more, please contact our Support team.